The University campus is a self-contained facility that provides all the essential facilities and infrastructure for the pursuit of excellence in higher education. 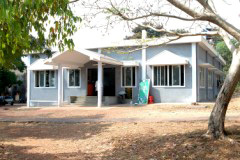 Among the several central facilities at Mangalagangothri, mention may be made of the spacious and modern library, the University Science Instrumentation Centre, the Microtron Centre, the Humanities Block, the new MBA Block and the cyber cafe. 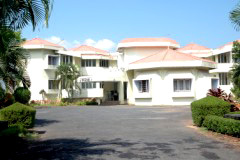 There is an impressive administrative building, two guest houses for visiting dignitaries and faculty, a well-equipped health centre, a useful shopping complex, two nationalized banks, and an ATM centre. There is a post office and a telephone exchange on the campus. 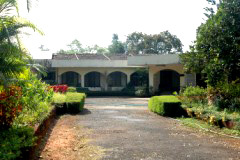 The University has provided residential quarters for its employees on the campus itself. 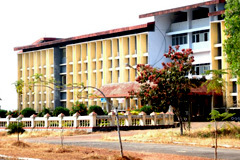 Mangalore University has grown impressively since its inception with 190 affiliated colleges including two constituent colleges, one at Mangalore and another at Madikeri, taken over by the University from Government of Karnataka in 1992. The University has established the PG Centre, Cauvery campus at Madikeri, which offers Postgraduate courses in Microbiology and Biochemistry. The University has taken steps to establish contacts through exchange of scholars and students with universities in USA, UK, Finland, Japan, Norway, Germany, Spain and other countries. A number of our faculty have been able to get fellowships and visit various universities to carry out their postdoctoral work. They have been on research assignments with assistance from Commonwealth, Humboldt, Rotary, Agatha Harrison Memorial, Rockefeller and Macarthur fellowships. The University has thus taken steps to benefit from the current trend of globalization. Today, the University is a major centre for the study of ecology and environment. Some of the affiliated colleges of the University have direct institutional linkages with reputed national and international institutions of learning. Many new courses of study have been introduced for the first time in the country. The University was the first to start undergraduate programmes such as Hotel Management, Human Resource Development, Fashion Design and Yogic Sciences. All these courses have attracted students from other parts of the country and abroad. The University has computerized its administrative offices in order to speed up the administrative process. 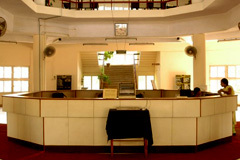 All postgraduate departments have been provided with Computers, Internet facility and Centrax telephones. The computerization of the examination section has facilitated the holding of examinations on schedule and the timely announcement of results. A University website has been created, which holds the database of all the colleges and postgraduate departments. Application forms to various courses and results of admissions and examinations are also available on the University website. All in all, Mangalore University presents the very picture of order and discipline: academic programmes are run on schedule, examinations are conducted on time, and the UGC norm of 180 working days in a year is fulfilled. About 411 scholars are pursuing their doctoral studies and faculty members are engaged in active research along with their teaching assignments. The University has received major grants from the UGC, DST, Govt. of Karnataka, Department of Ocean Development, Department of Electronics, Department of Science and Technology, Department of Space, Department of Biotechnology, Department of Atomic Energy and other nodal agencies. All these have given to the University a national and international visibility. 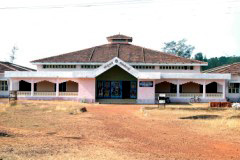 The University has established several endowment chairs with the objective of enabling studies on the development achieved in areas such as bank management, yoga, ayurveda, Kanakadasa studies, Sanskrit literature, literary criticism, Christianity, rural development, ecology and environment, Tulu language, literature, culture and visual/fine arts. Dr. Ambedkar Study Centre, Kanakadasa Adhyayana Peetha, Yakshagana Study Centre and Ambigara Chowdayya Peetha work towards an in-depth study of philosophy and its relevance to the present time. The endowment chairs of the University have helped to strengthen the University’s links with society. Under-graduate and post-graduate courses in the distance education mode have been introduced for the benefit of students. The programme will promote higher education through non-formal means through the distance education mode. The rationale of the distance education mode is to make learning accessible for those who, for various reasons, cannot avail of the benefit of regular courses. A new health and accident insurance scheme has been introduced recently for the benefit of students. The scheme will provide financial benefit to those who may be unfortunately involved in accidents and who have to be provided with medical assistance. An IAS/IPS coaching centre has been started for Scheduled Caste/Scheduled Tribe and other backward class students, with help from the Union Ministry of Social Justice and Empowerment. These innovative schemes have given a new dimension to the University’s efforts to make the educational experience secure and meaningful to its students. By entering into academic liaison with eminent scholars and centers of learning, the University has won for itself a respectable place on the educational map of India. The University is also proud of the fact its alumni occupy responsible positions in the country and abroad. In the last few years, major changes have been taking place in the University area. In this scenario of sweeping change, Mangalore University looks forward to playing the role of a participant in and a facilitator of such change and guiding this process towards ends that are commensurate with its goals and mission.